We had a late start to the season, and planting is later than usual. Should you use a starter fertilizer? The answer to that question is that it depends. Some research has shown later plantings will still benefit from starter due to decreasing time to silking. Decreasing the rate applied may be an option to speed up planting if you are questioning whether to keep using starter. There is no right or wrong answer whether to use starter or not in your production system. If you do choose starter here are five tips which may help you get the most out of your investment. Research does not overwhelmingly support the widespread use of starter fertilizer across Minnesota. The most noticeable benefit to starter is increased early growth. However, this effect can be purely cosmetic and not provide any benefits for yield. The primary benefit to in-furrow application is enhanced uptake of nutrients, like nitrogen and phosphorus, that are in short supply early in the growing season. Reduced tillage systems may have a greater benefit when using in-furrow starter due to cooler and wetter soils. Placement options can vary based on which nutrients you want to apply. Immobile nutrients like phosphorus, potassium, and micronutrients like zinc need to be placed near the roots for maximum benefit. Nitrogen and sulfur are mobile and too much of these nutrients applied near the seed can reduce germination. In continuous corn, we’ve seen some benefit to nitrogen and sulfur banded on the soil surface to the side of the seed row. This also can work for corn following soybean in poorly drained soils. Too much of any starter can present risks for stand damage. One way to mitigate these issues is placement away from the seed with at least one inch of soil between the seed and the starter band. There are many options to choose from when selecting liquid fertilizer for use as a starter. Corn yield is mostly impacted by nutrients in the shortest supply. Selecting a starter which will apply the needed nutrients is critical. If you want to enhance early growth, select a starter with a high P2O5 content that can economically supply 10 lbs P2O5 per acre and apply it in-furrow. This will increase growth, hasten dry down at the end of the growing season and possibly increase yield. For high residue systems, you’ll likely need nitrogen and sulfur combinations of 28 or 32% UAN with ammonium thiosulfate banded on the soil surface. The argument between whether to use a 100% ortho-phosphate starter versus a source with polyphosphate revolves around whether to buy a higher-cost low salt product versus 10-34-0. While it is true that plants will not take up polyphosphate, 10-34-0 contains both ortho- and polyphosphate. It can take time for polyphosphate to convert to orthophosphate but it should occur rapidly in most soils. There may be some benefit to the higher-cost products if you need to supply potassium, but the best bet is to compare products by calculating the cost of the products per unit nutrient applied. A product like 10-34-0 is still a good option as it contains a greater concentration of P2O5 than other products. 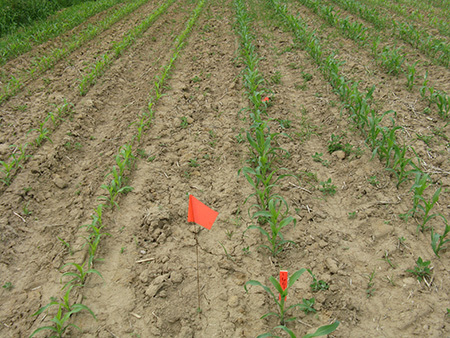 Rate options vary by placement and what nutrients are being applied. Calculators will aid in selecting the right rate, but keep in-furrow starter fertilizer rates as low as required to get the desired effect. Remember that the amount of fertilizer placed on the seed will vary based on soil dryness. Placement in a sub-surface band away from the seed or one or two inches to the side of the row on the soil surface allow greater flexibility. When selecting the right rate account for the nutrients in the starter. Those applications should be considered supplemental to what you apply in manure or dry fertilizer sources. With any fertilizer source the answer boils down to whether you need the nutrients. Yes, starter can potentially pay by reducing drying costs but that is not guaranteed. The best way to evaluate the practice is to turn off the starter for a few passes. See if starter pays, then adjust your practices to ensure you are getting the most profit for your investment.